Community Police Officer Todd Pataray and Sergeant Kelly Ka’aumoana-Matsumoto hold a “Click It or Ticket” sign with community volunteers, who helped kick off this year’s campaign with a sign-waving event Monday. 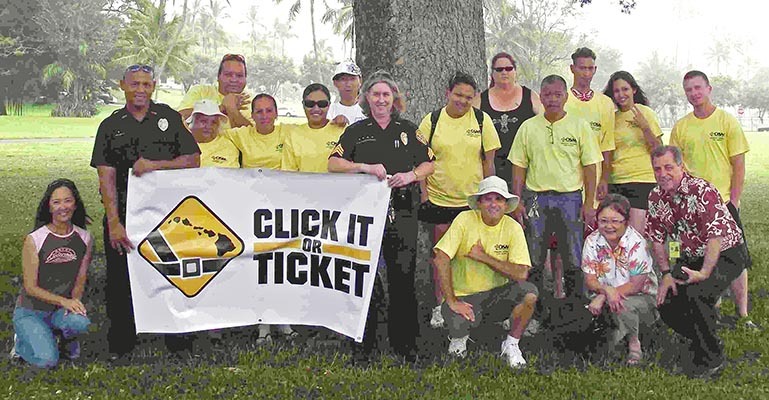 The Hawai’i Police Department’s Traffic Services Section organized a sign waving event on Kamehameha Avenue in Hilo on Monday (May 24) to inform motorists that the annual “Click It or Ticket” Campaign for 2010 has started. The Traffic Services Section was supported by members of the Office for Social Ministry, individual community members, Community Police Officer and members of the Impaired Driving Task Force at the sign waving event. Sergeant Kelly Ka’aumoana-Matsumoto, head of the Traffic Services Section, said roving patrols and seat belt enforcement checkpoints will be set up throughout the Big Island. The effort is part of a national and statewide campaign urging awareness and the use of seat belts. “Although this campaign is from May 24 to June 6, seat belt and child restraint citations are issued year round,” Ka’aumoana-Matsumoto said. Hawai’i Law requires those riding in the front seat to use their seat belts, and those 17 and under to use their seat belts in the back seat. The fine for seat belt violation is $92. Police will enforce child passenger restraint laws and will ticket drivers if children under the age of four are not properly restrained in a child safety seat-or in a booster seat until age 7. Child restraint and booster seat violators must go to court and face a fine of $100-$500 (depending upon the number of offenses), and attend a mandatory four-hour class. According to a statewide survey taken in June 2009, Hawai’i County had a seat belt usage rate of 98.1 percent, while the overall statewide usage rate was 97.9 percent. The same survey found that for Hawai’i County, infant use was at 92.45 percent and toddler use was at 68.80 percent.